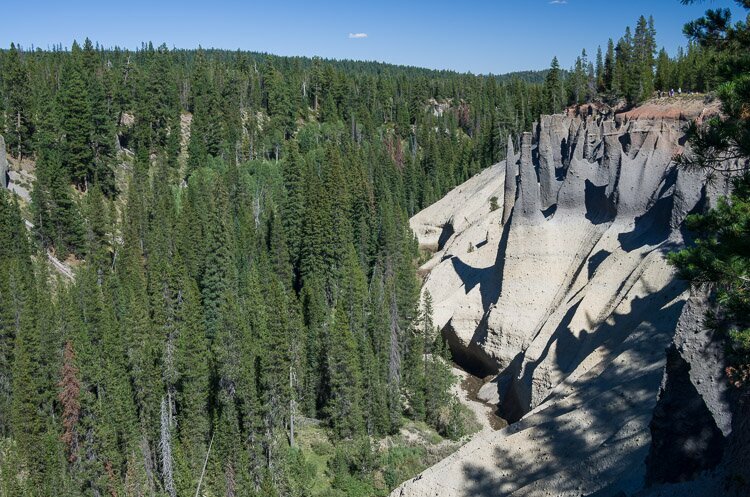 The Pinnacles are towering needle-like formations of rock, called fossil fumaroles, projecting from the Sand Creek Canyon floor, in Crater Lake National Park. The Pinnacles were formed under sheets of volcanic pumice that preceded Mazama's collapse (the same collapse that created Crater Lake). They provide quite a challenge for the photographer, not merely because particularly good vantage point (that’s easily accessible) to photograph them, but also because it’s rare to get really good light on them. The images present in this post were all taken during the middle of the day on sunny summer day. They don’t show the Pinnacles at their best. The Pinnacles would probably be more interesting if you could hike down among them, like you can with the hoodoos in Bryce Canyon. But due to the somewhat loose volcanic soil that surrounds them, carving trails around them probably wouldn’t be a good idea. I would imagine that the Pinnacles would best be photographed at dawn, when the soft light of the rising sun first bathed these rising gray spears.